Preheat the oven to 190˚C / 375 F /170˚C fan/340 F fan / gas mark 5. In a large bowl, combine the eggs, Parmesan, garlic, thyme, parsley, Worcestershire sauce and some salt and pepper. Add the stuffing and mix to combine. Add the beef mince and mix together until just combined. Do not over-mix. Divide the mixture into 16 equal portions and roll each one into a mini meatball measuring about 3cm in diameter. Heat one tablespoon of oil in a large pan over a medium-high heat. Working in batches so as not to overcrowd the pan, brown the meatballs on all sides. Add a splash of extra oil when beginning a new batch, if necessary. Place the browned meatballs on a baking tray and place in the oven for 12-15 minutes or until cooked throughout. Heat the tomato passata in a small saucepan and add the oregano and some seasoning. Preheat the grill to a high heat. Split open the hot dog buns and open each one out like a book. Line a second baking tray with foil and place the opened buns on the tray. 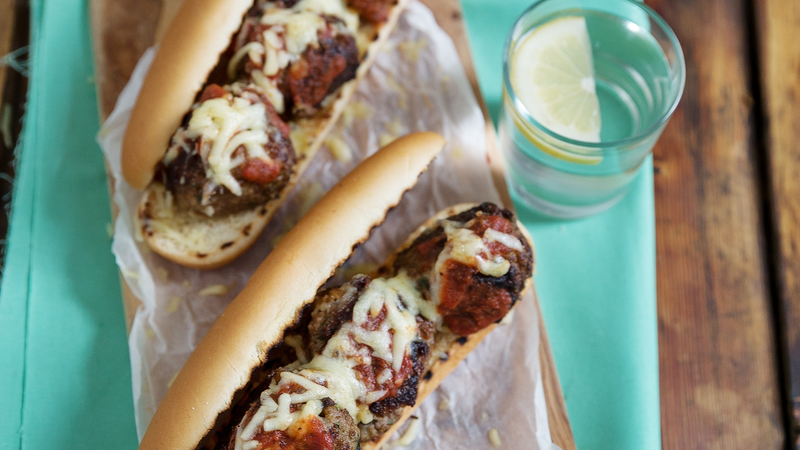 Top each bun with four meatballs, a few spoonful’s of tomato sauce and some grated Mozzarella. Place under the grill for 2-3 minutes until the cheese melts, then serve.